A party celebrates a home’s history and proud residents. Our new series on Arts and Crafts antique shops. Orange, Calif., bands together to save their housing stock. A Craftsman in Pasadena is updated to reflect its new owner. In Washington Heights, a Prairie-style Foursquare lives large. Adding on gently to a brick bungalow. An American Foursquare is released from its Victorian trappings. A home by Henry Greene holds warm family memories. A hidden Arizona mining town of charming bungalows. We hear from our dedicated readers. Bungalows and Arts and Crafts houses, all snuggled in for winter. Paint, clocks, art tile and furniture for your home. One of the few original California potteries still turning out trademark tile. Unique collectibles for gift giving. other Arts and Crafts news. 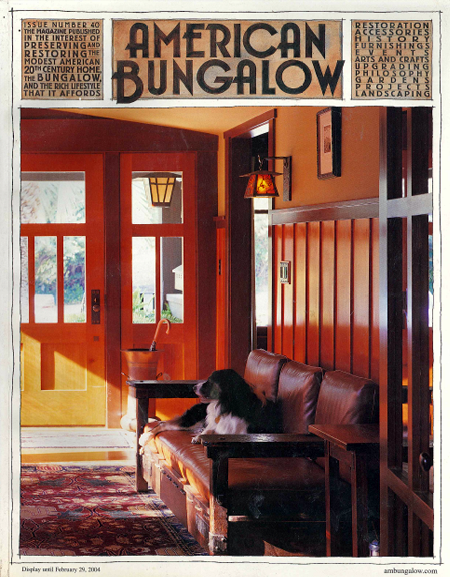 Pets revel in the bungalow lifestyle, too. The best selection of Arts and Crafts volumes.